The rest of the film is not bad. It’s the sort of light-hearted gangster movie in which every battle-hardened bad guy turns out to have a heart of gold (or at least the right blood type). The story begins with Big Steve Halloway (Charles Bickford) fixing an upcoming horse race. He blackmails nearly a dozen gamblers, saying his horse (the favorite) will lose the race if they pay up. In the process they’ll clean up on all the bets coming in. The gangsters all have wonderful names. Sorrowful Jones (Adolphe Menjou) becomes the soft-hearted hero of the story. Other gangsters have names like Regret (Lynne Overman), Sore Toe (Warren Hymer), Canvas Back (John Kelly), and Sun Rise (John Sheehan). The femme fatale of this boys club is Big Steve’s girl, Bangles (Dorothy Dell). She’s a cabaret singer and also turns out to have a heart of gold. Even though the gang eventually shows its true colors, there are occasional moments of shameful hilarity. One such instance involves the bookies each putting $100 down and betting on a little girl’s weight. During the initial betting on Big Steve’s fixed horse, a man comes in wanting to place a $20 bet. He’s good for the money, but doesn’t have it at the moment. He offers some collateral, a marker, in order to place his bet. Sorrowful’s toughness slips and he accepts the marker, Marthy Jane (Temple). The father (Edward Earle) leaves the little girl at the betting corral and runs off. Soon Sorrowful finds himself stuck with the little girl. Together with Bangles, the two of them provide for her while her father is away. When it becomes clear he’s not coming back, they pretend she doesn’t exist in order to avoid involving the cops. Instead they name her owner of Big Steve’s horse, as he has to duck out of town to avoid problems with the local bookies and federal agents. But as they spend time with the little dimpled child, their attitudes change. Initially, Marky (as they name her) is fanciful and imaginative. She labels all the bookies as knights of the round table. Pretty soon, however, her temperament changes and she starts becoming tough. She starts talking like one of the gang, and refuses to believe in the fairy tales she used to love. Ashamed of how they’ve corrupted a young girl, the gangsters attempt to put things right with a little party. At this point the movie becomes a tad excessively silly, though it never becomes completely derailed. There’s a certain amount of charm in Little Miss Marker, none of which comes from its nonexistent complexity. 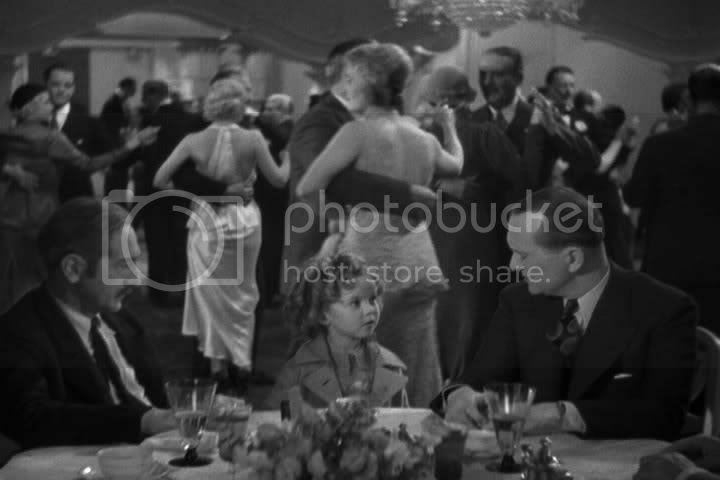 The dialogue sparkles like you would expect mid-1930’s dialogue to sparkle, and Shirley Temple repeating hardened gangster talk is incredibly adorable. She steals much of the show, not through her acting but merely by being herself. 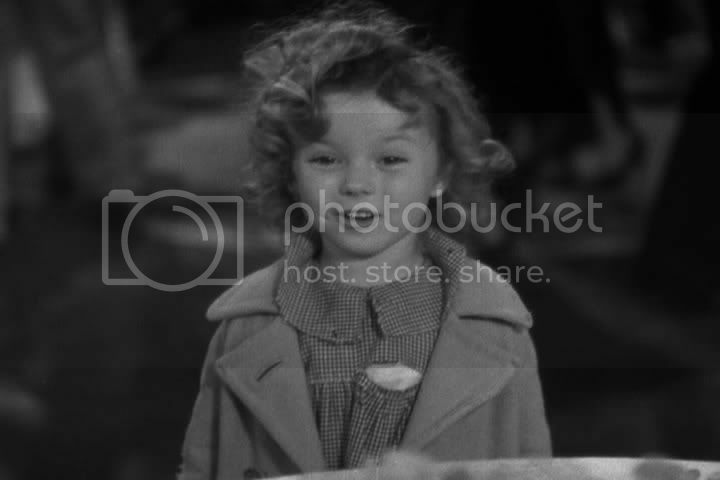 Her dimples and her curly hair, and the juxtaposition of her and the bookies make for an enjoyable film. While there’s not a great deal of story or depth to the film, it is cute and fluffy, in a positive way. There are a few relics of decades past that might be problematic for today’s audiences. 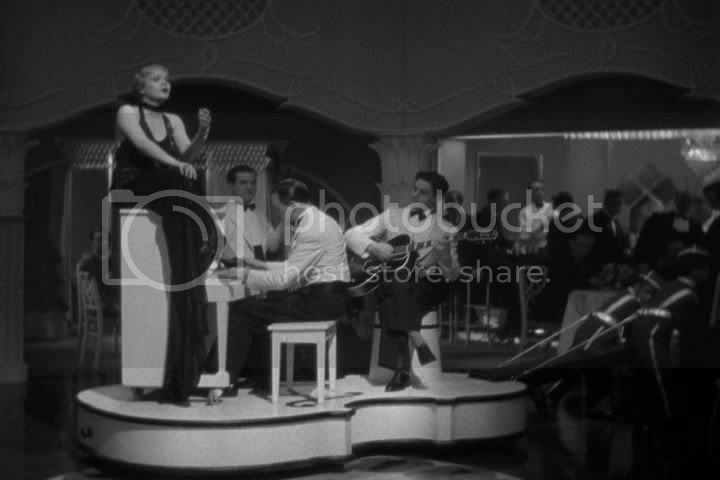 Every black character in the film is subservient to the white characters; most egregious is two young black children who pull Bangles’ show float around the stage floor as she performs at the night club. But this is a product of the times, and, while not forgivable, must be viewed in its proper historical position. There are other technical problems as well, including some poor continuity editing that occasionally intrudes on the film’s effectiveness. 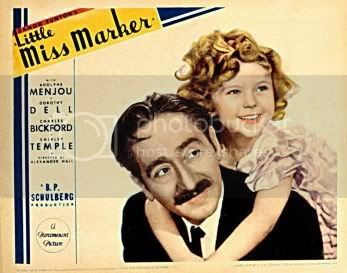 Regardless, the majority of Little Miss Marker is delightful and charming, even if it utterly lacks depth.